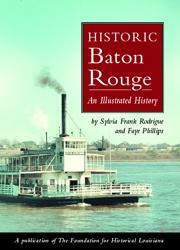 Historic Baton Rouge: An Illustrated History was published by the Historical Publishing Network for the Foundation for Historical Louisiana in 2006. It is no longer in print. The first history of Baton Rouge to be written in more than twenty-five years, Historic Baton Rouge: An Illustrated History is a handsome coffee-table photo book that contains a historical overview of the city's people and past. It starts with the first European explorers to meet those American Indians who had erected the storied "Red Stick" and continues through to the multinational crowds who live and work in today's bustling metropolis. The story contains tales of heroes and villains, never-ending challenges, enormous successes, and echoes of the lives of hundreds of thousands of people who have lived in Louisiana's capital city. Longtime residents will recall memories of times past, and newcomers will learn about the people and events who helped make Baton Rouge a special city. Both will see how the city's past resonates in its streets today. The French lived in the area briefly, but it was the British who established a permanent settlement at Baton Rouge. Spain wrested control in 1779 and ruled the locale until 1810. Baton Rougeans became American citizens as of January 1, 1811. Steamboats soon dominated the riverway, expanding commerce and creating new opportunities for travel and economic development. Slaves continued to work in the town and surrounding plantations, contributing to the economy and the local culture. The town's fortunes improved in 1846, when the state capital moved here from New Orleans. Secession, the Civil War, and Reconstruction were pivotal times, shaping the city's long-term prospects. The capital, moved to New Orleans during the war, returned in 1882, heralding a fresh start for the river city. While transportation in the form of railroads, followed by street cars, and later motor cars improved the quality of life and residents' abilities to move about, the people allowed segregation and Jim Crow to keep the city divided. Educational opportunities at the K-12 levels for both black and white people, never a top priority, did not improve much before World War II. The universities, LSU starting in 1860 and Southern starting in Baton Rouge in 1914--provided schooling at a college level and social events for the community. Over the years natural disasters and widespread illnesses, like yellow fever, took their toll on the city, but the population grew--especially after the founding of Standard Oil in Louisiana--and many prospered. Huey Long changed the face of the city and of LSU, for good and bad. Entertainment and shopping opportunities blossomed in the 1920s and 1930s. World War II provided new jobs after the Depression. Though integration in Baton Rouge went fairly smoothly, in comparison to other southern cities of a similar size, the civil rights era was fraught with tensions and challenges. Local African Americans boycotted city buses in 1953, but the effort ended with the buses still segregated. Southern University students led the way in seeking lunch counter service at local stores in 1960. Relations between the races deteriorated, reaching their worst point in 1972, but in the end the struggle for civil rights succeeded: legal segregation ended. In the 1970s and beyond the city transformed into what it is today, with the establishment of preservation societies, the proliferation of arts and culture, a focus on trees and green space, continuing struggles over education, downtown building programs, and ever-expanding suburbs. As the population of Baton Rouge boomed after Standard Oil's arrival in 1909 and again during World War II, it increased tremendously-- overnight--after Hurricanes Katrina and Rita struck Louisiana in 2005.